Oxytocins are hormones found in mammals. It acts on the brain. In humans it is released during female reproduction, especially during and after childbirth. It has other effects. It encourages pair bonding, and parental behaviour. It is released during intimate moments during orgasms and even hugs. For this reason it is often called the 'love hormone'. Strange to say, the oxytocin released by the pituitary gland cannot reach the brain: it does have effects on the rest of the body. The reason is that there is a blood–brain barrier which prevents large molecules from getting into the brain. Instead, the hormone is produced by special nerve cells inside the brain. Oxytocin is also released through the use of recreational drugs like MDMA and some prescription anti-depressants. 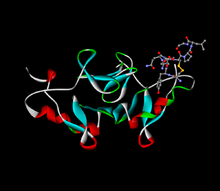 Oxytocin was the first polypeptide hormone to be sequenced and synthesized, by Vincent du Vigneaud and colleagues in 1953. ↑ "Oxytocin – the great facilitator of life". ↑ "Oxytocin – The love hormone that could cure shyness". the Daily Telegraph. ↑ Ross HE, Cole CD, Smith Y et al. (2009). "Characterization of the oxytocin system regulating affiliative behavior in female prairie voles". Neuroscience 162 (4): 892–903. doi:10.1016/j.neuroscience.2009.05.055. PMC 2744157. PMID 19482070. ↑ "The Good Drug Guide : new mood-brighteners and antidepressants". www.biopsychiatry.com. ↑ du Vigneaud V. et al (1953). "The synthesis of an octapeptide amide with the hormonal activity of oxytocin". J. Am. Chem. Soc. 75 (19): 4879–80. doi:10.1021/ja01115a553. http://pubs.acs.org/doi/abs/10.1021/ja01115a553. This page was last changed on 14 February 2019, at 13:02.